Animal cells are the basic unit of life in organisms of the kingdom Animalia. They are eukaryotic cells, meaning that they have a true nucleus and specialized structures called organelles that carry out different functions. Plants, fungi, and protists all have eukaryotic cells, while bacteria and archaea have simpler prokaryotic cells. Animal cells do not have cell walls or chloroplasts, the organelle that carries out photosynthesis. Cells carry out all the processes of the body, including producing and storing energy, and making proteins, which are molecules that have roles in metabolism, DNA replication, and transportation of other molecules. Cells are highly specialized to carry out specific tasks. For example, the heart has cardiac muscle cells that beat in unison, and digestive tract cells have cilia, finger-like projections that increase surface area for the absorption of nutrients during digestion. There are over 200 different types of cells in the human body. Red blood cells contain hemoglobin, the molecule that carries oxygen, and they have no nuclei; this is a specialization that allows each red blood cell to carry as much oxygen within it as possible. Multiple cells form tissues, which are organized groups of cells that carry out a certain function. In turn, groups of similar tissues form the body’s organs, such as the brain, lungs, and heart. Organs work together in organ systems, like the nervous system, digestive system, and circulatory system. Organ systems vary depending on the species. For example, insects have open circulatory systems, where blood is pumped directly into body cavities and surrounds their tissues Vertebrates such as fish, mammals, and birds, on the other hand, have closed circulatory systems; their blood is enclosed within blood vessels where it travels to target tissues. Cells are the “building blocks” of organ systems. The cell has a variety of different parts. It contains many different types of specialized organelles that carry out all of its functions. Not every animal cell has all types of organelles, but in general, animal cells do contain most if not all of the following organelles. 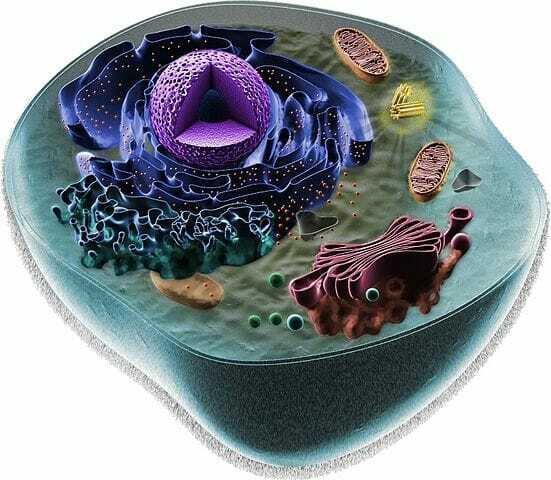 This is an artist’s rendering of the parts of an animal cell. The nucleus contains a cell’s deoxyribonucleic acid (DNA), its genetic material. DNA contains instructions for making proteins, which controls all of the body’s activities. In the nucleus, DNA is tightly winded around histones, which are proteins, to form structures called chromosomes. The nucleus regulates which genes are expressed in the cell, which controls the cell’s activity and functioning and will be different depending on the type of cell. DNA is located in the nucleolus region of the nucleus, where ribosomes are made. The nucleus is surrounded by a nuclear envelope (also called nuclear membrane), which separates it from the rest of the cell. The nucleus also regulates the growth and division of the cell. When the cell is preparing to divide during mitosis, the chromosomes in the nucleus duplicate and separate, and two daughter cells are formed. Organelles called centrosomes help organize DNA during cell division. Cells usually have one nucleus each. Ribosomes are where proteins are synthesized. They are found within all cells, including animal cells. In the nucleus, a sequence of DNA that codes for a specific protein is copied onto a complimentary messenger RNA (mRNA) chain. The mRNA chain travels to the ribosome via transfer RNA (tRNA), and its sequence is used to determine the correct placement of amino acids in a chain that makes up the protein. In animal cells, ribosomes can be found freely in a cell’s cytoplasm, or attached to membranes of the endoplasmic reticulum. The endoplasmic reticulum (ER) is a network of membranous sacs called cisternae that branches off from the outer nuclear membrane. It modifies and transports proteins that are made by ribosomes. There are two kinds of endoplasmic reticulum, smooth and rough. Rough ER has ribosomes attached. Smooth ER does not have ribosomes attached and has functions in making lipids and steroid hormones and removing toxic substances. Vesicles are small spheres of lipid bilayer, which also makes up the cell’s outer membrane. They are used for transporting molecules throughout the cell from one organelle to another, and are also involved in metabolism. Specialized vesicles called lysosomes contain enzymes that digest large molecules like carbohydrates, lipids, and proteins into smaller ones so that they can be used by the cell. The Golgi apparatus, also called the Golgi complex or Golgi body, is also made up of cisternae, but the cisternae are not interconnected like those of the ER. The Golgi apparatus receives proteins from the ER and folds, sorts, and packages these proteins into vesicles. The process of cellular respiration occurs in the mitochondria. During this process, sugars and fats are broken down and energy is released in the form of adenosine triphosphate (ATP). ATP powers all cellular processes, and mitochondria produce a cell’s ATP, so mitochondria are commonly known as “the powerhouse of the cell”. Cytosol is the liquid contained within cells. Cytosol and all the organelles within it, except for the nucleus, are collectively referred to as a cell’s cytoplasm. Cytosol is mostly made of water, and also contains ions like potassium, proteins, and small molecules. The pH is neutral, around 7. The cytoskeleton is a network of filaments and tubules found throughout the cytoplasm of the cell. It has many functions; it gives the cell shape, provides strength, stabilizes tissues, anchors organelles within the cell, and has a role in cell signaling. There are three types of cytoskeletal filaments: microfilaments, microtubules, and intermediate filaments. Microfilaments are the smallest, while microtubules are the biggest. The cell membrane surrounds the entire cell. Animal cells only have a cell membrane; they do not have a cell wall as plant cells do. The cell membrane is a double layer made up of phospholipids. Phospholipids are molecules with a phosphate group head attached to a glycerol and two fatty acid tails. They spontaneously form double membranes in water due to the hydrophilic properties of the head and hydrophobic properties of the tails. The cell membrane is selectively permeable, meaning it only allows certain molecules through. Oxygen and carbon dioxide pass through easily, while larger or charged molecules must go through a special channel in the membrane. This maintains homeostasis within the cell. 1. Animal cells do not have ____________. D is correct. Animal cells do not have a cell wall or chloroplasts like plant cells do. All cells have a cell membrane. 2. What is the function of a cell’s vesicles? C is correct. Vesicles are spheres of lipid bilayer that transport molecules throughout a cell. Choice A refers to ribosomes, B refers to the Golgi apparatus, and D refers to the nucleus. 3. Which organelle has a role in making proteins? D is correct. All of these organelles are involved in the process of making proteins. Ribosomes put together the chains of amino acids that make up proteins. The ER modifies proteins, and the Golgi apparatus sorts, folds, and packages proteins into vesicles.